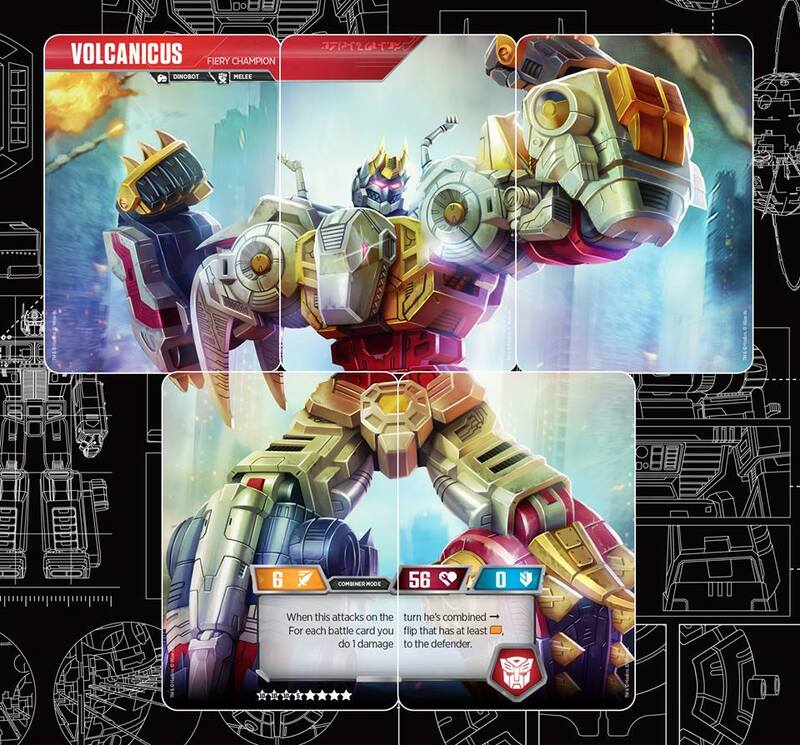 Courtesy of the official Transformers Trading Card Facebook and Instagram we have new images of the Wave 2 “Rise of the Combiners” Volcanicus Fiery Champion Cards. We have a look at the impressive art for Volcanicus (drawn by popular artist Marcelo Matere), and the individual cards the five classic Dinobots: Grimlock, Swoop, Slug (Slag), Sludge and Snarl. 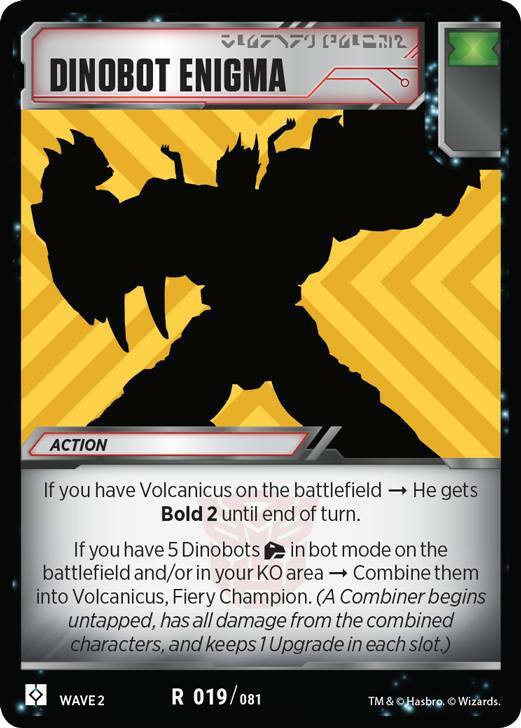 Additionally, we also have a look at the Dinobot Enigma card, which you need to form Volcanicus in the game. This is our second Combiner reveal after Predaking. This new expansion will be available since March 1st, 2019 and 6 Combiners were announced to be available. We are yet to see the other 4, but you can check out all the images after the jump. Which other Combiners are you expecting to see on this expansion? Share your expectations on the 2005 Boards! You only get to pick up one tho, so if you flip two or more you have to make a choice. Oh man is the wave 2 hype real… I can't wait. If you flip a card with a green icon while either attacking or defending you may scrap a card from your hand & pick up that green card to put into your hand after the battle turn is over. Well, you'll never combine it with 56 health. I think it maxes out as 36 health with the two KO'd components. You'd need sludge just to get to max HP. I'm aware, and that's what makes this even funnier/deadlier. Imagine you blasting through Volcanicus' HP, then WHAMMO! Back to full health. Gotta go through all that again only to face the same event two turns and an ISF later Both impressive to see and frustrating to face against. I can't wait to try it out myself, but I am cautious about trading 3 characters for 1 (kind of like the opposite of Metroplex). I'm giving up 2 card draws 2 potential upgrade plays, and 2 potential actions for the rest of the game for dinobots (4 for Predacons). I guess we'll have to see, maybe there will be more battle cards to help even out the action economy for combiners, but right now I'm hesitant. I kind of feel like the enigmas should be stronger cards in their abilities though. Giving up those extra actions/upgrades you get from untapped un-combined characters seems like a heavy price to pay for what we're getting from combiners right now doesn't it? If WotC doesn't get more generous on the Rare distribution, these Rare Combiners are going to be heartbreaking (and wallet crushing) to collect. With a few exceptions, all of the art so far has been from the old Transformers Legends mobile game. So that's why I wouldn't assume guys like Abominus and Piranacon (who's full team never showed up in game) won't be quite ready yet. Unless Predaking and Volcanicus are a sign they're going to dig into newer assets. Even then, however, the PotP art only has *one* mode available for newer teams/combiners. You joke, but I'd be in for a Reflector Combiner that's just a camera on the Combiner side. 12 stars, 0 attack, 3 defense, 18 HP, Specialist, Plan 5… this could work! Then I guess congratulations are in order for Devastator. pretty sure on the WTF@TCG WotC said that one of the combiners isn't a 5 member team. Too early to go that wide with this concept. They'll first let the current Combiner format play out a bit and then once they get a feel for it make adjustments and decide how to roll out non-traditional "combination" type figures like that. I'm wondering if "combiner" is a very loose term, technically flywheels is a 2 part combiner, as is Sklylynx, roadcaeser is 3 part, and so on. Superion, Menasor, Defensor, Bruticus, no? Because Predaking/Volcanicus are considered rivals, so there are the other two. Leave Abominus, Computron, maybe Sky Reign for the next wave. They aren't. We've already been told that There will be combiners of different rarity. Predacons are uncommon. I'd be willing to bet we'll get 2 common combiners at the minimum so people check out the mechanic (plus otherwise would mean most of the character cards in the set are rare, which would be dumb). However all the pieces of a combiner are the same rarity. I checked after I posted , forgot PK was Uncommon. I'll be Happy if this is the only rare. Why are these Rare? I hope the combiners aren’t all Rare, that’s going to be enraging. Hopefully this is the only rare combiner.